Play FreeCell, Sea Towers, Penguin, and more! Game Numbers compatible with Windows FreeCell! Have you played FreeCell yet today? If you have played the FreeCell game that comes with Windows, then you know how addictive FreeCell can be. But wouldn't it be nice to have a little more? Wouldn't you like to be able to undo more than one move? In fact, wouldn't it be great to be able to undo all of your moves? Wouldn't you like to be able to save a game in progress, so if your boss walks in, you can resume work where you left off when she leaves? Wouldn't it be nice to be able to make moves with a single mouse click? Ask no more because FreeCell Wizard is here! Select among 3 different card sizes. The game will automatically choose the card size that best fits the game window. Download additional card sets! Change the card faces and backs from among the many different card sets available. And to top it off, there are 15 other solitaire games like FreeCell in FreeCell Wizard, such as Sea Towers and Double FreeCell, plus a Wizard where you can create your own games! Ordering FreeCell Wizard is risk free! Our order pages are on a secure server. Feel secure in ordering from an established company that's been doing business on the internet since 1995. The 16 games are only a one time fee of US$12.95. FreeCell Wizard is for Windows. However, order FreeCell Wizard and you get FreeCell Plus for Mac OS X free. 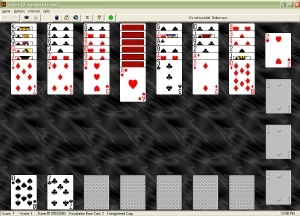 FreeCell Plus for Mac OS X contains FreeCell and several other games. For an additional US$9.95 shipping you can receive our CD-ROM that will install the latest version. We offer an unconditional 30-day money-back guarantee! If for any reason you are not satisfied, you can return FreeCell Wizard for a full refund. Please take advantage of this offer, and buy and download FreeCell Wizard now . You'll enjoy countless hours of fun playing FreeCell. If you have already downloaded FreeCell Wizard or want a CD-ROM copy, register or order a CD-ROM. P.S. If you aren't ready to buy yet, download our free 30 day trial of FreeCell Wizard.